This is a great protection spell. It will ward off evil and protect you home. This spell has been modified and passed down thorough the years and I have found it to be very effective and simple. You guys should know by now I am a simple witch. I am always trying to simplify my spells to make them more accessible and easy for the beginners to do. You can change the spell anyway you would like by adding herbs, candles and other correspondences to fit you needs. 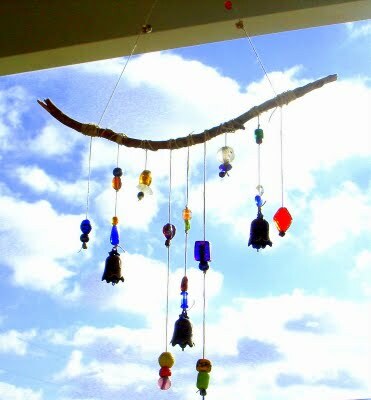 You can also make your own wind chimes (probably better than buying one) with beads, strings and other household items. Draw a star on the ground with the chalk. Place the five candles on the five tips of the star. Place 5 drops of the protection oil in the center of the star and place the wind chimes in the center. Light the candles clockwise and say the following as you light each candle. When all the candles are lit. Sit in front of the star and meditate silently. You don’t have to meditate on the flame, but if it helps do so. Preferably you will sit quietly with eyes closed. As you mediate see your home protected completely, through all seasons your home is safe. See your home with a shield of protection so that anyone that tries to harm you would never succeed. Let the candles burn down. Get your muslin bag and place the candle stubs, and a mix of protection herbs in side the bag and tie it on to the wind chimes. Place the wind chimes outside and your home will be protected. Thank you for visiting my website. I am very thankful to you all. Please leave comments and questions below and remember to visit tomorrow to find the newest spells on the website!